Reddit is one of those spaces on the Internet that I’ve historically stayed mostly away from. Due to my role at MacStories, however, and a thriving Apple subreddit, I’ve been there more in the past year than all prior years combined. During that time I’ve tried all the best iOS Reddit clients in an attempt to find one that’s right for me. For one reason or another, none have stuck; today, however, that changes, with the release of Apollo. Apollo was created by a former Apple employee, Christian Selig, which explains why the app feels like it could have been an Apple invention. Design trends from iOS are found all over the app, from its clean, simple look highlighted by accent colors to its tab-based navigation bar, pervasive use of swipe gestures, and more. These iOS conventions pair with a browsing interface that looks and feels like a social app – if you’ve scrolled Instagram or Twitter before, you won’t have any trouble here. The thoughtful use of these tried and true designs makes Apollo instantly familiar, and thus accessible to any iOS user. The app is divided into five main sections, with the primary being Posts, where all Reddit browsing is done. Posts contains all subreddits you’re subscribed to, with those you’ve marked as favorites near the top, alongside options to view posts from other parts of Reddit like the top trending posts. While scrolling through a subreddit, you can use buttons or swipe gestures to interact with posts with ease. 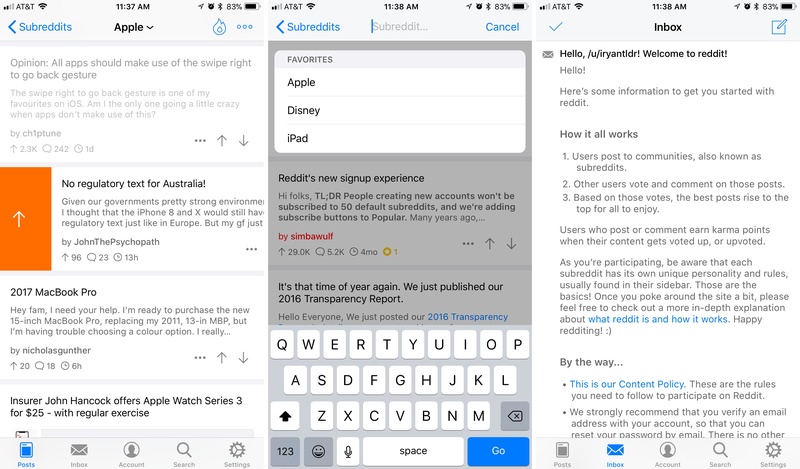 3D Touch enables peeking into posts; if you want to view more, you can pop the post into place, whereas releasing and going back to browsing will mark that post as read – a helpful touch. Apollo is an extremely fast app, with animations, scrolling, media, and more feeling instantaneous. But besides its quick responsiveness, one way the app improves your browsing experience is with a feature called the Jump Bar. Tapping the title of your current subreddit in the title bar enables quickly typing the name of another subreddit to visit, or, my favorite approach, choosing from the list of subreddit favorites that automatically appear on-screen. It’s a small thing, but it’s one of those tiny features that makes a big difference in your overall experience. Outside of Posts, Apollo’s four other main tabs are Inbox, which houses your private messages, then a tab housing your account’s activity – posts, comments, saved posts, upvotes, and more; you can also switch accounts from here. The final two tabs are Search and Settings. Part of what makes Apollo feel like a complete package is its assortment of customization options, accessed from the Settings tab. Reddit power users will appreciate the depth of flexibility here. 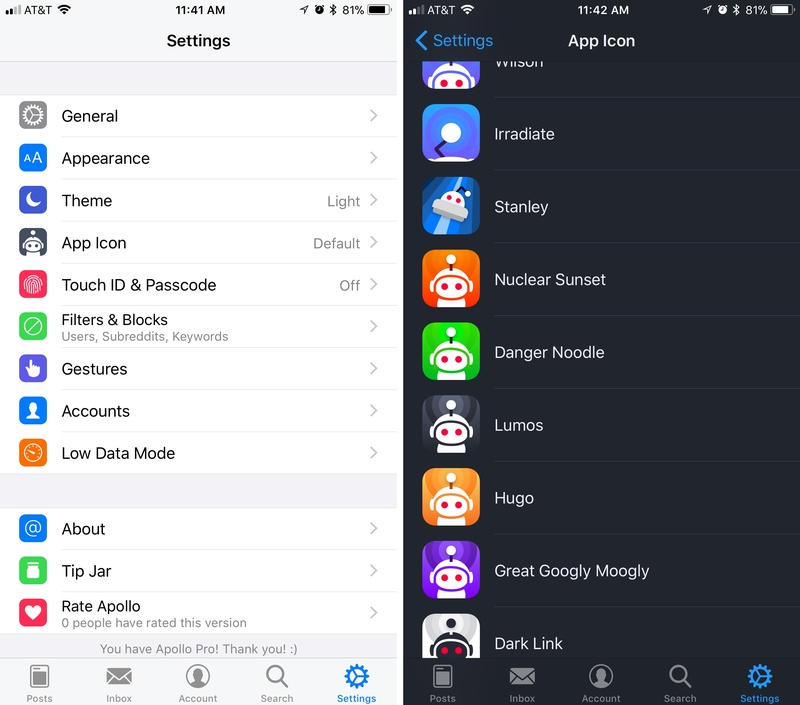 There are a variety of tweaks you can make to the app’s behavior in areas like posts and comments, plus extensive appearance options – there are beautiful light and dark themes, which can be switched between anywhere in the app by long-pressing the navigation bar; while I adore the standard app icon, Apollo also includes lots of excellent alternatives; subreddits can be viewed with large content previews or in a compact list; the developer also plans to add custom font options soon. Two other areas of customization are particularly important: Filters and Gestures. The Filters screen lets you set filtered keywords so that any posts containing those words will be excluded from the app; you can also exclude certain subreddits from the All Posts feed, and block users. In the Gestures screen you can custom tailor swipe gestures in five different areas of the app: posts, comments, inbox, profile posts, and profile comments. Each of these sections can be assigned different actions for left and right short and long swipes, making a grand total of twenty different settings you can tweak. Markdown: Markdown is Apollo’s chosen text flavor when composing replies, posts, or private messages. Even if you’re unfamiliar with the common syntax, shortcuts above the keyboard make it easy to bold, italicize, or add a link without any Markdown knowledge at all. iPad: Apollo not only includes iPad support, but it looks great even on the 12.9” iPad Pro and offers support for Split View. The only drawback is that app-specific settings don’t appear to sync between devices currently, so you'll need to set them on each device you use. GIFs: What would a Reddit client be without GIF support? Apollo offers a fun GIF scrubbing feature, so you can scrub back and forth through a GIF’s animation. At the start of this review I mentioned my relative lack of history with Reddit because, on one hand, it may not make me Apollo’s target user. The app was built by and for Redditors, with all sorts of customization features meant to please that base. However, whether the app’s developer meant it or not, I believe Apollo is also the right app for someone like me: a casual Reddit user who’s interested in becoming more than that. Every detail of the app has been carefully designed and thought through, with countless special touches and an interface that feels right at home on iOS 11. 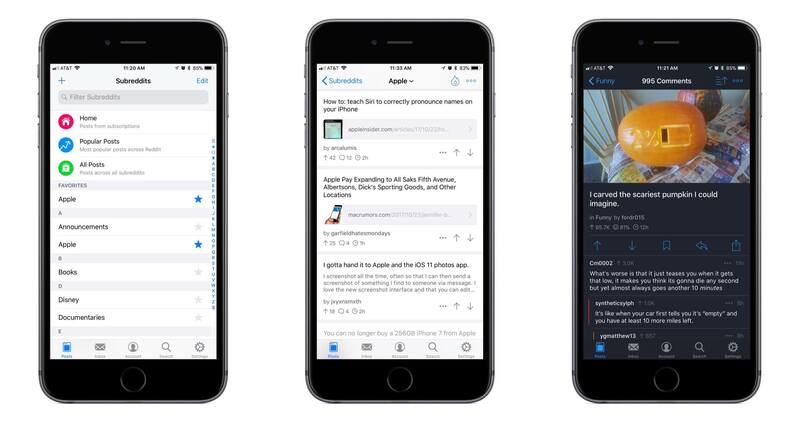 Apollo makes the wild world of Reddit more accessible than ever before, and it may just be the best designed social feed app I've ever used. Apollo is available on the App Store as a free download, with an optional In-App Purchase to unlock all features.